Christmas Eve is an important time in the church with the midnight mass ushering in the birthday of the Christ child. One Christmas, the Bells were all together in Rome. First we had an amazing Christmas Eve dinner of 24 kinds of fish dishes at a friend’s home. Fish has been the meat of Fridays for Catholic believers as Friday was the day of the Crucifixion of Christ, and in memory, for years, it became a fasting or no meat day. The twenty four is for the date of Christmas Eve. There is controversy about whether this is the date of His birth or chosen as an arbitrary date in connection with the solstice. But non the less , it is the date chosen and now set by years and years of tradition. At this amazing dinner, that was a tad uncomfortable for me because I eat very little if any fish, we were served various kinds of fish cook in 24 dishes for the date of December 24. Well, I was so looking forward to seeing midnight mass. We had been given tickets from a very devout friend, yes tickets to the coveted mass. No money is charged, the tickets are only for crowd control. We were running late from the dinner and had to almost run to St Peters. We actually got in but there were so many people it was impossible to get to the chairs near the alter. All the lights were illuminated and both organs were belting out in accompaniment for the huge crowd singing as they waited for the for the mass to begin. You might think it strange that I mentioned these details, but I had only remembered the lights on and the gold and marble shimmering with the organs playing and the congregation singing….all that at once, on one feast day with Pope John Paul II entering the church. It is an amazing interior any time, but totally breathtaking with the lights, organs, and singing. 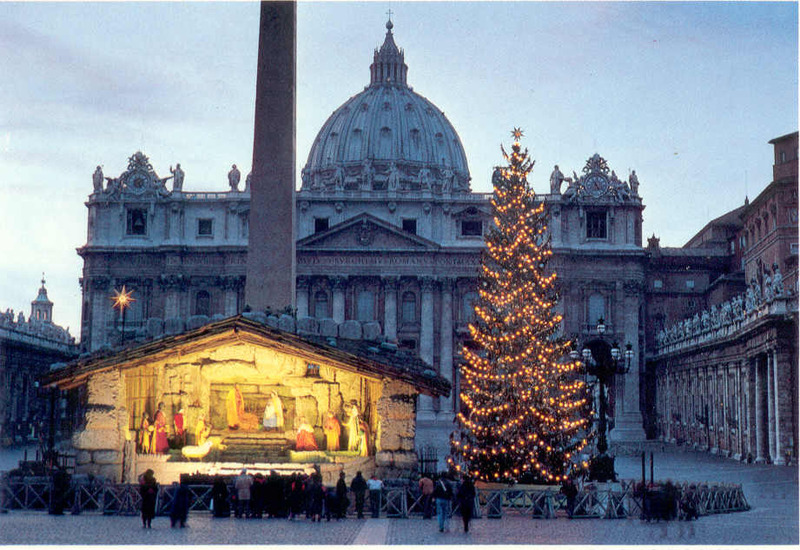 This Is Christmas Eve in Roma! And Merry Christmas to you my friend ! Rome is a beautiful place, I would love to visit it again. We were actually at St. Peter’s Cathedral one Christmas Eve after David was living in Rome for a semester! Annet, hoping you have a blessed and beautiful Christmas Season, almost here! This was so lovely, I think this is the most extraordinary photograph I have seen of this special event. I embrace this in a big hug, which is up there in my memories of my own three little cherubs who played donkeys and lambs in the Christmas pageants in our church. Happy New Year, too! What a lovely message! No higher compliment for a blogger. . . thank you. With love and best wishes for you and your family for a joyful Christmas and New Year. We travel 24 hours starting Saturday AM to arrive in India on 12/29 in India at 3 AM! So excited ! Stay tuned!! Thank you for stopping by! It is a beautiful church. Merry Christmas! This entry was posted in Architecture, Religions of the World, Uncategorized and tagged Birth of the Christ child, blogging, Christmas Eve, Merry Christmas, midnight mass, Roma Italia, St Peters Basilica. Bookmark the permalink.